Thousands of theories have emerged in regards to what the official title of Star Wars: Episode IX will be, with actor Dominic Monaghan claiming that only director J.J. Abrams actually knows that information. 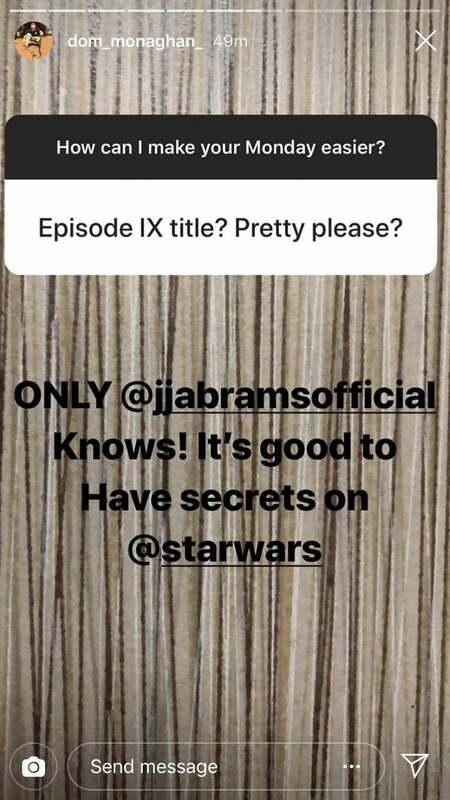 While interacting with fans on Instagram, Monaghan was asked, "Episode IX title? Pretty please?" to which he replied, "Only [J.J. Abrams] knows! It's good to have secrets on [Star Wars]." Fans have been pestering various members of the cast and crew on various social media platforms in hopes of getting details about the new film, with Monaghan's comments confirming that the easiest way to prevent leaks of the title would be to not share the title with the cast. Some fans might think the film's stars are being coy when they claim not to know the title, but not knowing it means they can't accidentally let the title slip. This security measure was seemingly confirmed in the Star Wars: The Last Jedi making-of documentary The Director and the Jedi, available on the film's home video release. The behind-the-scenes footage showed writer/director Rian Johnson regularly having differences in opinion with star Mark Hamill in regards to the film's trajectory, with one of the documentary's more touching moments depicting Hamill learning that the film was titled "The Last Jedi." Upon realizing this title could be used to describe his character, Hamill's perspective instantly shifted. Despite not actually knowing the title, that hasn't stopped Hamill from regularly teasing his followers on Twitter about the upcoming film. Just last week, Hamill teased his fans about the title of Episode IX, sharing an image from Futurama which predicted that the film would be called "Yoda's Bar Mitzvah." The actor joked, "Disappointed there was no Star Wars trailer shown during the Super Bowl? Agonizing over how long you'll have to wait until they drop the title? RELAX nerds! Futurama predicted it years ago & we all know: Cartoons. Never. Lie. EXCLUSIVE BREAKING 'NEWS': Episode IX: Yoda's Bar Mitzvah." Hamill previously recalled just how much security surrounding the saga has changed over the years. Star Wars: Episode IX is set to hit theaters on December 20th. Are you surprised that only J.J. Abrams knows the title? Let us know in the comments below or hit up @TheWolfman on Twitter to talk all things Star Wars and horror!